The following 12 figures are the last 12 figures needed to complete the online version of the UofM Figure Guide and, hopefully, an even more in-depth published Figure Guide (the rough draft version). That means only 12 figures away from fully documenting a Master Set of 1,528 M.U.S.C.L.E. figures. The preference is to actually borrow the figures instead of buying or trading for them. The University of M.U.S.C.L.E. will cover all the shipping costs. However, if an owner is only looking to sell or trade any of these last 12 figures there is still interest. 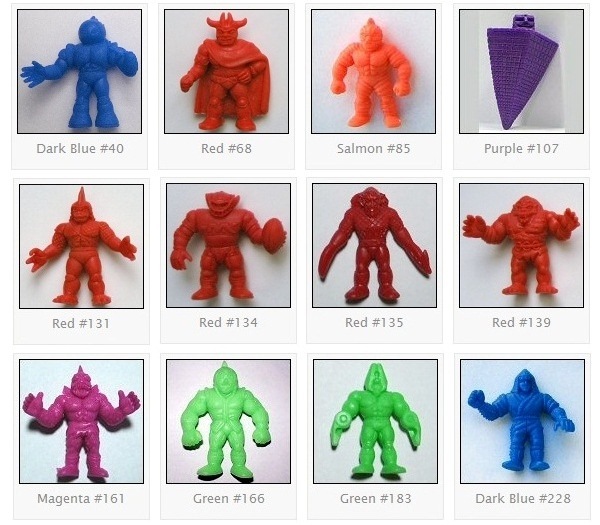 If you have any of these figures, then please contact the University of M.U.S.C.L.E.. Thank you in advance to anyone that can help! All of the images below were taken, with permission, from Soupie’s M.U.S.C.L.E. Colors Image Archive and hosted on the UofMUSCLE.com servers. This entry was posted on Tuesday, June 4th, 2013 and is filed under History, Research, UofM News. You can follow any responses to this entry through RSS 2.0. You can skip to the end and leave a response. Pinging is currently not allowed.